A Lawful Development Certificate (Existing) was granted for the use of a building as a single dwellinghouse near Hawkhurst under Tunbridge Wells Borough Council. The applicant instructed Patrick Durr Associates to confirm the lawfulness of a former outbuilding at their property which had been used for over ten years as a single dwellinghouse. The applicant explained that when their son turned 18 years old, he vacated the family home to live in the former outbuilding with his partner as a separate home. The building included its own kitchen, bathroom and two bedrooms and was formerly a workshop and store connected with the main dwelling. Over the years, the applicant’s son lived in the building before moving out and being replaced by another sibling and his partner. For this application is was important for us to establish the true nature of the occupation and what evidence we had available to substantiate the claim. Only when we believed we were ready to pass the ‘on the balance of probabilities’ assessment threshold did we submit the application. Following a generally uneventful Council assessment, the development was granted lawful. The only part we sought to clarify during the Council process was the immunity period by which the application was to be judged by. It was proposed that as this was a planning breach culminating in a material change of use, the application should be judged under the four year planning immunity rule, rather than the more arduous ten year change of use and breach of planning condition standpoint. 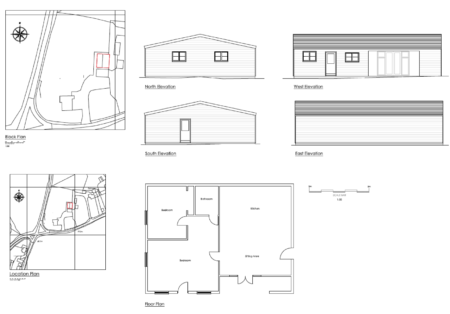 Thankfully, in basic terms this has provided the applicant with a second independent dwelling on site which can be occupied and sold separately. It may be that the applicant will look to redevelop the new dwelling by proposing a replacement house under Local Plan policy. If this was carefully managed in collaboration with Council advice, it could be that the applicant can achieve a new purpose-built dwelling onsite in lieu of the lawful outbuilding, which may then be sold to reduce or rid an applicant’s mortgage. Now such an idea is a long way off, but wouldn’t that be a very early Christmas present! If you have a similar scenario with an unregulated dwellinghouse, or indeed you are looking to maximise a site by potentially rebuilding a dwelling, please Contact Patrick Durr Associates.